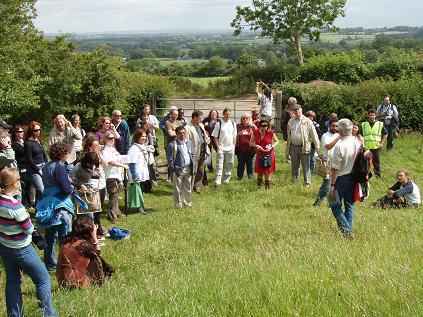 Two bus loads of Archaeologists arrived at Tara this morning for a Tour of the Hill. 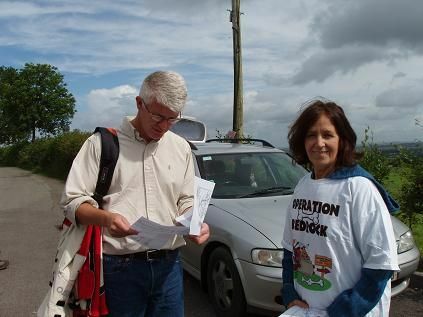 Greeting the Archaeologists, Tara Campaigners handed out leaflets entitled "What You Can Do To Save The Tara/Skryne Valley " as well as promotional literature for the Meath Master Plan. The Tour got underway led by Conor Newman who was pleased to have the Campaigners join in -and very enjoyable it was too! They did not however visit Lismullin or the Sousterrain under threat. 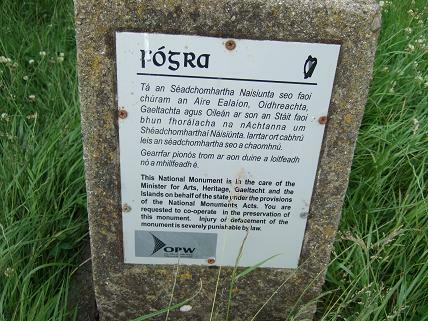 Rath Maeve, M.143, is a large circular rath and a protected national monument close to Tara. It was the mythological home of Maeve, the old earth goddess and consort of successive kings of Tara. As such it has a central place in our heritage and should be afforded all the respect and care it deserves. 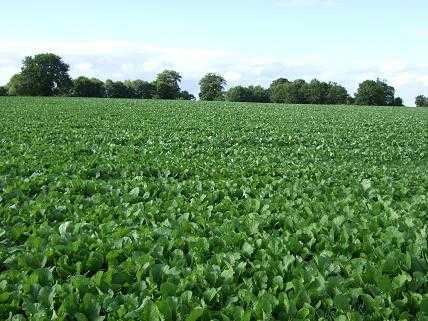 However yesterday when we visited it we were shocked to see that the entire rath has been planted with Kale. This involved it been ploughed up, planted and it is to be expected, later harvested. Kale is a deep growing vegetable with a long tap root. The harvesting will entail soil disturbance to a dept of at least half a metre. As far as we know no archeologically investigation has taken place on Rath Maeve and no archaeologist was present at the ploughing so priceless items belonging to our history and heritage could have been removed or destroyed. It is known and accepted that this happened in the past and much of what was of value under our soil was destroyed or carried away. That this is again happening today and under a green environment n minister beggars belief. We also visited the henge site at Colvonstown, with an ancient standing stone at its centre. M.135. 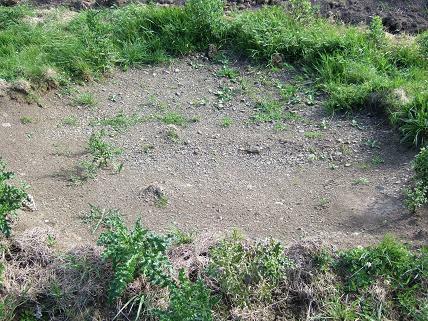 This henge is a perfect horse-shoe shaped henge with an opening to the east and so one can assume it was used as a spiritual place of sun worship and ritual. Just last year one could see the traces of a path leading across the fields to the henge, now however recent ploughing has obliterated this. The henge is now full of thistle but there are tractor marks where the plougher drove his tractor over and across the henge, damaging it severely. Also at the back of the henge, away from the roadside, a large portion of the edge has been removed. This henge has stood sentry here for many, many centuries but one more year of this vandalism will regulate it to the long, long list of endangered, neglected and destroyed monuments which now litter our once beautiful land. Earlier in the day we seen this at Teltown, where just ten years ago a farmer was allowed remove a large part of the ancient royal stand without sanction or imprisonment. 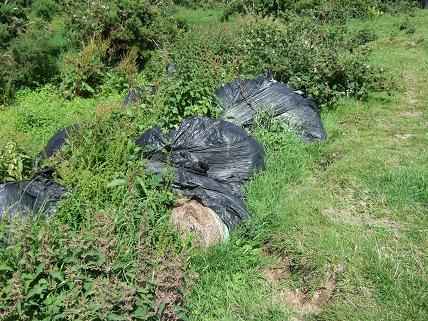 This same farmer now uses these ancient Knockans as a place to wrap and throw his unwanted plastic. These monuments belong to us. They could be the focus of a vibrant sustainable and unique tourist industry, something we are going to need as productive industry heads east and leaves us to pick up the pieces of what some still call a boom. We need these monuments in these multi cultural times to provide an anchor and identity for our own young. Above all we need them to remind us of our once proud spiritual past. If we are to stop the feral vandalism now running riot in our land, where nothing seems to be respected, treasured or cared for then we need to knock loudly on the doors of our politicians and if they continue to neglect their duty, as they are now doing, and refuse to do their jobs which they are paid to do, then it must be made clear to everyone; we do not have a future. All our hopes, dreams and aspirations can be easily removed by first removing our past. Market forces will do the rest. We have photographed and documented all of the above, it is now on record and the photos can be sent to anyone who wishes to see them. The Monument numbers given are those used in the OS Map No. 43. Would WAC like to see this? Rath Maeve and The Knockans are both protected National Monuments. Damage to these incur severe penalties. Hello OPW!!!!!!! 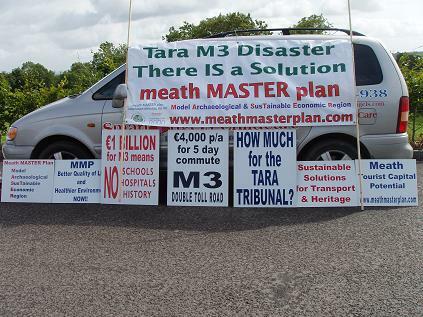 No one in a government or semi-state body will move against the government's avowed intentions over Tara. It's a shame, a deep shame, but it's the philosphy of nod-and-wink. We have disgraced ourselves again. Dublin Robert and myself all managed to get into the plenary session. was voted on and the entire hall showed a vote in favour. distorted/doctored and in effect the archaeologists were intimidated. Maggie submitted on the Henge and the sutarian in Lismullan woods. alternatives were been discussed. she sat dead quiet. so it was another brilliant day for Tara. abstentions because of lack of information. long I'll be hounding Clair Smith to find things out. Thanx Emma - The elephant in the room well and truely made its presence felt!! For ORAL answer on Wednesday, 9th July, 2008. Minister for the Environment, Heritage and Local Government (Mr. I propose to take Question Nos. 73 and 78 together. approved road scheme, such as the M3. valley, between Tara and Skryne. directions in the circumstances in which they were issued. A new Video by Mark Cantwell and Chris Eva of interviews with Maggie Ronayne, Julitta Clancy and Sean Gilmartin , speakers at the World Archaeological conference in Dublin earlier this year is available at the following link.